Summary: A decent episode makes some major revelations about Will, but falters in its execution. 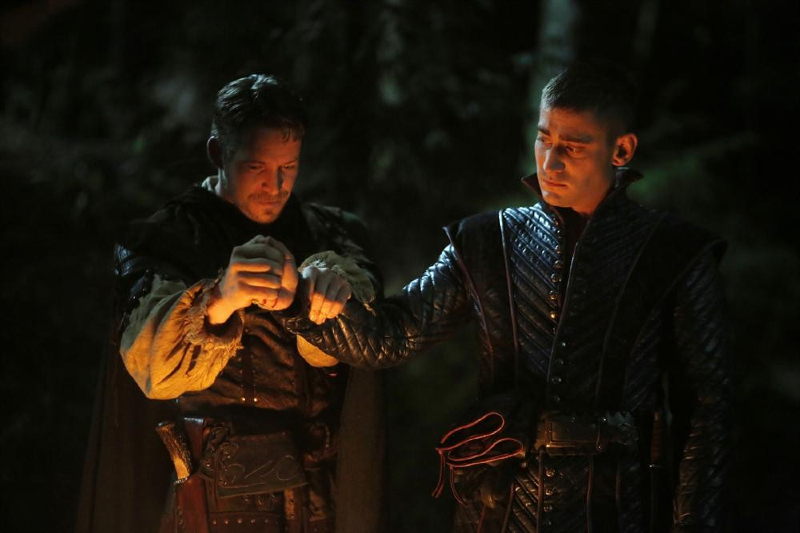 In the past, Will Scarlet joined Robin Hood and his Merry Men, and comes up with the idea to rob Malificent’s castle. In the present, Will comes up with an idea to use a magical item called a forget me knot, which can peer into the last major moment that happened in any given place, to see who dug up Cyrus’s bottle. After making a deal with The Caterpillar for its location–who believes that no matter what, he will win–Alice and Will discover the knot at the house of the cannibalistic Grendel. They’re immediately captured by Grendel, who uses the knot to view a beautiful young couple that used to live in the house. Will realizes that Grendel is the man in the knot, and tries to sympathize with him by recounting his own love lost. He fails, but Alice uses the sharp edges from her wish gems to cut the rope. Before they can escape, they’re stopped by the Bandersnatch, a monster that Jafar and the Red Queen sent for Alice to get her to use her wishes. Alice and Will save Grendel from the Bandersnatch and use the knot to trick it; since they saved Grendel, he lets them go. Alice and Will use the knot to discover that the White Rabbit dug up the bottle and delivered it, angering Alice. Jafar and the Red Queen arrive to Grendel’s house; Red Queen reveals she turned Grendel into what he is, and promises that she can reunite him with his wife if he reveals how Alice escaped. He does, telling them that the Knave of Hearts is travelling with her; Jafar kills him in return. In the past, Will betrays Robin Hood by stealing a magical item, putting the Merry Men in Maleficent’s crosshairs. His Anastasia is revealed to be a younger Red Queen, and the two use the magical looking glass Will stole to open a portal to Wonderland. The funny thing about Once Upon a Time in Wonderland is that, even though it exists in a huge multiverse, so far it’s been quite intimate. The scope is especially narrow, even as the world grows bigger, and it lends itself to feeling more familiar with this group of characters even if we still don’t know much about them. The downside is that something like tonight’s reveal, which has the Red Queen established as Will’s beloved Anastasia, is not terribly shocking. The minute Anastasia’s face was obscured, it became clear that her identity is meant to be a surprise…and there’s only one of our core Wonderland characters that’s a woman aside from Alice. Granted, it would be insane if Anastasia was revealed to be Jafar or something, but alas, this show isn’t that awesome. There’s still much to be revealed about Will and Anastasia’s past, but keeping the show closed in is actually promising if this does stay as a limited run. Keeping the one-season story tightly focused on the core characters avoids many of the pitfalls the original Once has faced, with its focus often split between so many characters that the plot itself suffers. Wonderland has clear goals to reach and mysteries to unravel, so even though the plot isn’t all that engaging–and let’s face it, the simple “Save Cyrus” mission is paper thin–the feeling that this journey may be worth it by the end helps to hold our attention. “Forget Me Not” is most effective when it’s throwing out (admittedly obvious) parallels between Will and Grendel, and the show seems to have a good understanding of how much better the character stories are than the overarching one. Where this particular outing falters is its timing. The present day plot is all about Grendel recovering from the loss of his love, which Will can sympathize with. That’s all well and good. The problem is that Will’s flashback doesn’t get to that point, instead hinging on his unsurprising betrayal of Robin Hood and the unsurprising reveal of Anastasia’s identity. It’s fair to say that Will and Anastasia’s story will be Red Queen’s central flashback, so perhaps it’s unavoidable, but with such a small cluster of episodes to structure there ought to have been a way to make this all work. As it stands, there’s two pieces to a decent story, but they don’t click too well thematically between the main plot in the flashback to be as emotionally effective. The flashback has Will at his highest while the Grendel story is supposed to expose Will at his lowest. But we see so little of Will with Anastasia, and only get a vague idea that he’s “doing it for her,” that it doesn’t check out. As such, a potentially beautiful exploration of Will’s brokenness becomes a sadly unremarkable outing. Though the plot of the episode isn’t perfect, there’s a few interesting pieces. The concept of the forget me knot is a clever one, as is its use to defeat the Bandersnatch. Though, it did feel a little forced that Alice and Will would be totally okay with burning what could be an extremely valuable tool, in a “we need to get rid of this deus ex machina” kind of way. We also get some clues to Jafar’s endgame; it seems his goal requires Alice to make all three wishes, which will undoubtedly happen before season’s end. It’s always more fun when the hero’s accomplishments manage to play into the villain’s hands. However, Alice is going to have to be in serious peril before making the wish, as this episode proved her resourcefulness and refusal to waste them, so hopefully the show lives up to that promise. It’s also exciting that the Once universe is starting to dip into other types of free domain literature, using Grendel from Beowulf in this case. It’s a bit worrisome that a mythology as rich as Beowulf might have been wasted in Grendel’s one-off appearance here, but at least he was handled from an interesting angle. Steve Bacic could have phoned in his part as Grendel, but he actually balanced pathos for the creepy cannibal. Bacic was particularly solid in his final scene, breaking through the heavy make-up with emotional acting from his eyes. Portraying any level of depth with little of your face is tough, so it’s quite notable when an actor–and a guest one at that–is able to pull it off and make something monstrous so sympathetic. When Grendel discovers that the image of his wife in the forget me knot is gone, Bacic makes it quite heartbreaking. 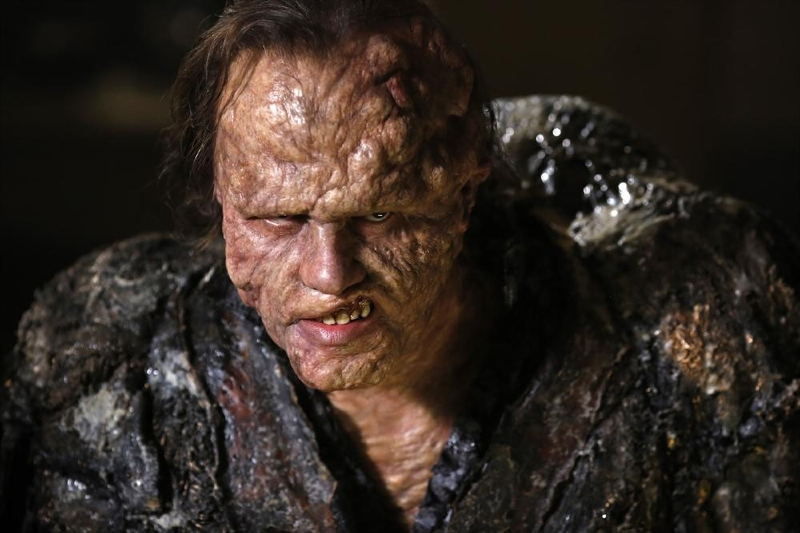 Grendel might not have been the most unique looking bad guy, but the effectiveness of the make-up is miles beyond the CGI the show normally uses. The green screen this week continues to be awful, with the characters very obviously superimposed in the earlier wide shots. The Caterpillar, on the other hand, is surprisingly well-rendered compared to many of the other effects. The animated characters thus far have been handled fairly competently, actually, with focus placed on key moments rather than the animators trying and failing to outdo themselves. There seems to be a sense of the limitations when it comes to the White Rabbit and The Caterpillar, so the appearances themselves are limited. It’s a step up from it’s parent show’s CGI character flops, though Grendel shows how good practical effects can work. Either way, the show still needs to learn how to use (or not use) the green screen so much, because it’s bad at it. The themes and structure may not particularly hold up, but the cast continues to be more than competent. As per her character’s heritage, Alice gets some clunky dialogue from time to time (“Where can we find this terribly useful item?”) but Sophie Lowe makes it her own. Lowe really shines this week with her subtle body language; her sympathetic look at Will during his confession of love, and subsequent eye roll when his plan fails, are perfect. Michael Socha, meanwhile, is always solid as the more well-written Will (whose surname is revealed to be Scarlet, which is adorable.) Socha is particularly good at letting Will’s frustration reveal itself without making him look week, relaying the feelings without deterring from his calm, cool demeanor. Emma Rigby, while still fairly weak as the Red Queen, seems to fit right in the shoes of Anastasia. It’s possible that her awkwardness at playing the villain is intentional seeing how she started out, though it would be ideal if she played both roles well. Peter Gadoit continues to be a weak link–granted, still without much to do–but it’s telling when a major plot point is the “look of concern” on his face that…doesn’t have a look that’s much different than his normal face. In spite of some misgivings, Wonderland has managed to be fairly competent in its delivery of this particular story, even if the story itself isn’t terribly interesting. There’s enough bits of imagination and effort put in from the creators and the actors that it’s all enjoyable, and the pace at which things are unfolding fits perfectly. This hour has the most references to its parent show thus far (with Robin Hood, his Merry Men and Maleficent) but still feels as though it’s forging its own identity, heavily focusing on the core characters rather than aiming higher than it can reach. Wonderland may not be the most mindblowing show of the season, but it certainly knows what it is; when it’s trying to be a campy, colorful show about the importance of love, that counts for a lot. The forget me knot being a window through time harkens to that window on Fringe that could peer to another universe. I still say Sophie Lowe reminds me a lot of Anna Torv, and coupled with this show’s emphasis on the power of love undercutting a super weird and twisted world, this show is like an understated and unintentional Fringe homage. I really like that The Caterpillar is basically an information kingpin in Wonderland. Iggy Pop’s voice for him is awesome. Yeah, uh…that screaming head is the cheesiest thing this show’s done so far. And that’s saying a lot. “It’s a lot bigger than it looks on the outside.” That had to be an intentional Doctor Who reference. It just had to be.